So here’s something I put together quickly by grabbing from stackoverflow, to generate some meaningless random string based on a given length of letters. 😀 This is actually a simple dot net implementation where as you could use it as a static class and use it anywhere you want. may be? up to you! // but it doesn't matter if cut off the excess. Now I don’t own this original implementation, I just put it into a static class and used in one of my apps. Sorry I don’t have the actual source of it. 😦 but I do recall I grab it from stackoverflow. Anyways use it as you wish. Last Friday (20th January, 2017) I did a tech talk at Singapore Mobile .Net Developers meetup, under the topic “The three Awesome tools by Xamarin – Workbooks/Inspector/Profiler”! First of all here are the slides. So today I thought of picking up three awesome tool that has been released by Xamarin last few months, which are going to be extremely useful for Xamarin Mobile Development. Or simply you’re just trying out an experimenting some piece of code before you do some actual implementation in your actual project code? Oh well what a hassle is that? A perfect blend of documentation and code and immediate live preview results. Xamarin Workbooks, is a prefect solution for experimenting with Xamarin and dot net code implementations and even as a learning tool for exploring code snippets and various kinds of implementations in Xamarin and dot net. So workbooks packs a bunch of awesome features, such as full fledged code editor with Roslyn IntelliSense, which has similar syntax coloring just like in Visual Studio. It has in-line compiler diagnostics support as well. Attached with a rich text editor for you to add side by side code and documentation on the go. You could also easily search and add nuget packages as you go, just like you would do in Visual Studio, and instantly preview the results in console, or any mobile emulators as you have chosen. You can easily save an share your workbooks with anyone and they could open it up and try out as they wish. Now as mobile developers we need to make sure we are giving a smooth intuitive user experience for our beloved users. So in order to do that, we need to make sure our app is fully optimized for the memory usage, process usage and various resource usage without causing any excessive lags or crashes. Another aspect is that as mobile developers we need to always focus on the over flow of the resource usage in our application at run time so that we could do the necessary improvements in our code to reduce any excessive resource usage. Something very important to keep in mind is that when we are dealing with Xamarin Mobile Development, we have to deal with both the Xamarin dot net environment and the Native environment at run time. In that case the available native profilers we have for android and ios can not help to analyze our xamarin dot net environment. So we need something better than just native profilers for our Xamarin Mobile applications. Xamarin Profiler is a tool that seamlessly integrated with your Xamarin Application, collects and displays information to analyze your application at run time. This can easily be used for finding memory leaks, resolving performance issues, monitoring resource usage at the run time, and more over to polish up your mobile app before delivering to your users. Allocations instrument is used for analyzing the memory usage of your application at any given point of time at the run time. Time Profiler instrument is used for tracking app performance, whereas it allows you to see which function took the longest to finish its execution. It also packs up these additional features allowing us to further drill down into details to analyze our application run time. So we always have to do the tiny changes in padding or the height or the width or may be a tiny hex value in the color and so on, whereas every time we do a change we need to recompile the project and run. And then even if you get the app to run, you still have to go navigate to the page that you just made the changes to, which takes a lot of time. Now I’m aware of the existence of Xamarin Forms Previewer, but if you had already tried it out, we are well aware there’s a whole bunch of bugs and issues with it when it comes to complex UI designs, which has a whole bunch of custom renderers. Something really cool about this tool is that it gives this awesome exploded 3D layers view of your application UI. Which makes it very easy to analyze the rendered layers and get rid of any extra layers to improve performance. Xamarin Inspector has two main features, first is the REPL access. REPL stands for Read, Evaluate, Print and Loop, which allows you to inject code to your application in real time. Then the Visual Inspector allows you to interact with your UI hierarchy in real time in an intuitive 3D view. Something very important to keep in mind is that, with the latest update for this tool, they are providing you direct Xamarin Forms support, so no longer you have to deal with the native-rendered properties, you could easily make changes to your Xamarin Forms properties on the fly. So I played around with Xamarin Forms Control Templates! Yes I did and I came up with something pretty cool. 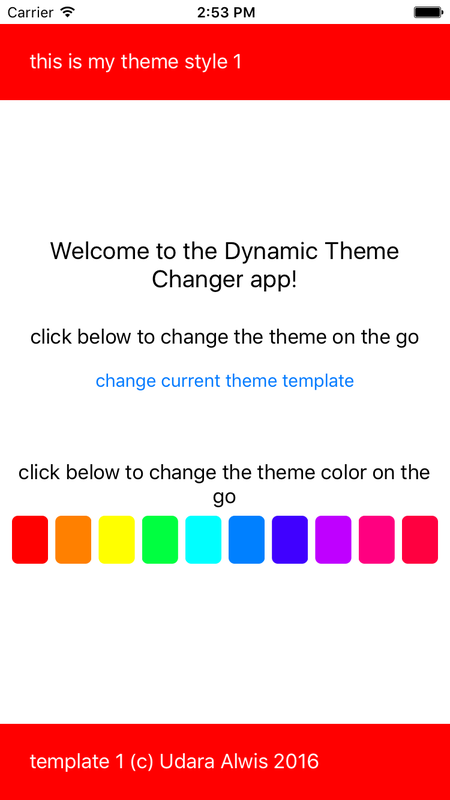 Do you want to change your app’s theme on demand at run time? or load a different template for your pages at run time? or even simply change the app’s colors on demand? So basically what I built was a simple app where you could dynamically change the App background color theme and change the change the App theme style on demand. As you can see you can change the color theme of the app by clicking on the color buttons and change the theme style by clicking on the theme change button, which loads a different theme for the App if you closely notice. 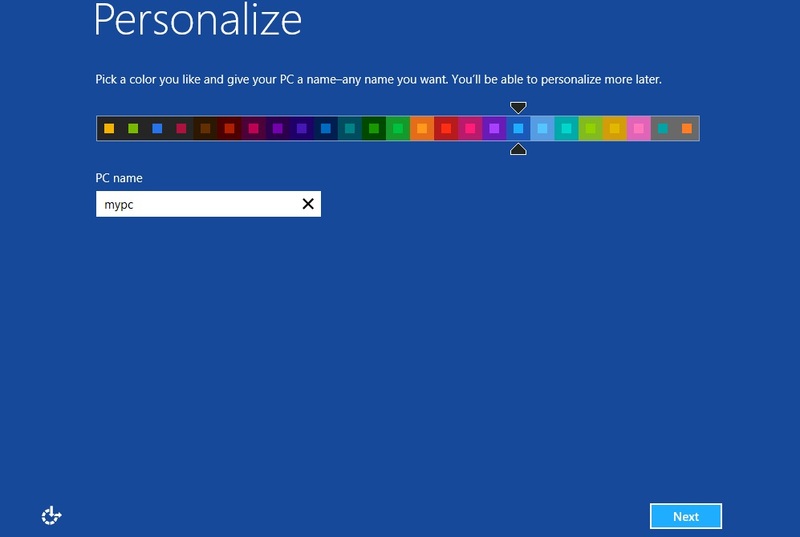 The honest inspiration for this is that I remember back in the days when I was installing Windows 8 in my laptop, at the first time boot up, they ask you to choose the color theme you would like to use. What are Xamarin Forms Control Templates? Nuff said, if you want to learn more about it, read the documents. Here I’m going to explain how you could achieve the above cool stuff using Control Templates for Xamarin Forms. Xamarin Forms Control Templates Binding? Otherwise we would have to create different Control Templates for every single color, which will be very heavy and long code, but thanks to Binding we could do it with ease as described above. First of all let’s create our templates, we are going to create two templates with different styles, as show in the below screenshots of the finished implementation. Template Header and footer will have a background and simple Label for both header and footer. Template Header will have one label with with a white background color, and footer will have two labels with white background color. For now just forget about the color and we will focus on the initial Template Design. Alright now let’s get to work. Let’s begin by creating the project, and make sure to create XAML based Xamarin Forms project. Then let’s create our Control Templates in the App.xaml file, within the Application.Resources tag by adding them to the global ResourceDictionary, so that they could be accessed in anywhere of the app at runtime. Alright let’s create our first Control Template. Text="this is my theme style 1"
Text="template 1 (c) Udara Alwis 2016"
There you have it, as you can see we have created a template with a Grid where we are aligning the page content in the middle as the ContentPrensenter and the Header and Footer accordingly at top and bottom. We have added simple Labels to each Header and Footer with some text in it. So at the run time the Color will change according to the “ThemeColor” property which we will be implementing in the ContentPage. Now here’s our second Control Template. Text="this is my theme style 2"
As you can see the difference of this Template is that we have added extra columns to the Grid container and added extra labels to fill in. Also you may have noticed that we are setting the Label background to White color in this template. Alright there goes our two templates in this example. Next let’s implement the design for our ContentPage. So those two Template themes are now ready to be applied for any ContentPage in our App. having a ContentView which will position itself in the ContentPresenter in the Templates once we bind to them. 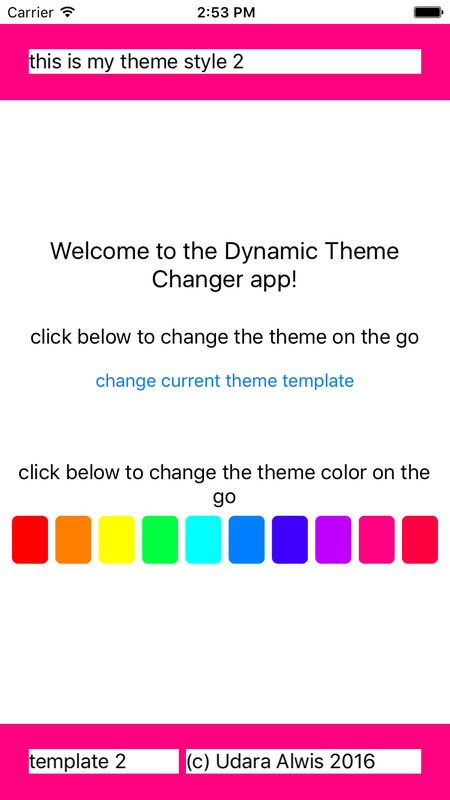 <Label Text="Welcome to the Dynamic Theme Changer app!" <Label Text="click below to change the theme on the go"
<Button Text="change current theme template" Grid.Row="1"
<Label Text="click below to change the theme color on the go"
You can see I have implemented the ThemeColor property where our Templates will be binding their Color properties to. Then take a look at the event OnColorChangeButtonClicked which is the event that is fired by the set of buttons with different colors as we implemented in the UI. So inside this event we are retrieving the button’s background color and setting that value to our ThemeColor property, which will in return reflect to the Template that has been loaded to the page at that moment. And then in the Constructor we are loading the two templates we created before into our page by accessing the Application Resources dictionary so we can use those instances to change the them on the go. Inside the OnButtonClicked event we are switching between the two template themes we have loaded above. So you can see clearly that when you click on the “change current theme template” button, the theme immediately changes to the next template. Is your Visual Studio stuck at, Emulator is already running? So few days back after doing a fresh installation on my WIndows 10 laptop, and installing Visual Studio, I tried running a Xamarin Forms project, with the Visual Studio Android Emulator. The project was successfully building itself, and the Visual Studio Android Emulator also started running successfully, but then the build process was on a hang state after the Emulator started running. Specifically the build log was on a hang state after “Emulator is already running” step, as I saw in the output log in VS. So after Googling a while I figured out the problem thanks to wasting a bunch on hours on google search and forums, since many others were also having the same issue. So let me post the solution for you right here. You must keep in mind that my project was building fine, and the Emulator also started running successfully and booted up itself. I was having a already built solution and up and running Emulator, but the VS couldn’t connect to the Emulator. The cause for this is Visual Studio debugger was unable to connect to the started Emulator through the ADB (Android Debug Bridge). This is due a wrong registry entry in the system, where as Visual Studio is looking to start up the ADB and connect to it, in order to connect to the Emulator, but due to this wrong registry entry, VS is unable to find the path to ADB, to start it up. This seem to be happening by default with fresh installations of VS lately, where as the Android SDK installation path in the above registry entry doesn’t seem to be matching with the actual SDK installation location in our system, which is probably done by default when installing Visual Studio 2015. So yeah as the article explains we just have to update the registry entry with the accurate path to the Android SDK installation in our system, so that Visual Studio can start up ADB to connect to the Emulator. to find the actual Android SDK path in your system, that is referred by Visual Studio, go to the top tool bar of Visual Studio, and open the Android SDK Manager as shown below. If you did the default Visual Studio installation with the Cross-Platform mobile dev tools, then your path location should also look similar as above. Copy that path, or type the same exact path on Run command and open the folder and copy the full path from there. Open registry editor, by “regedit” in Run window and navigate to the following Registry. Now open the Path registry key and change the value with the above Android SDK path which you copied earlier.